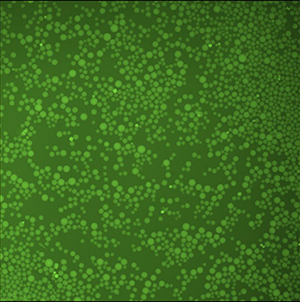 Agarose beads are hydrogels with a diameter of 10 – 1000 µm. Agarose is made of repeating units of agarobiose. Agarose beads are normally cross-linked and porous so protein may flow through the beads. The beads can be used for size exclusion or affinity chromatography. For affinity chromatography ligands (like NTA or IDA) are covalently linked to the agarose bead polymer so tagged proteins can be separated from other proteins. Agarose matrices have been used for protein purification for decades, and a broad variety of agarose-based matrices is commercially available. Physical properties can vary significantly between the different matrices. This short summary shall support you in finding the optimal product for your research. 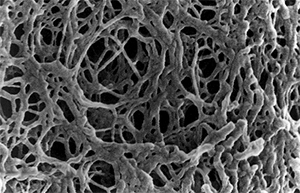 Superflow, Sepharose, Agarose - what's the difference? Our PureCube Agarose is highly-crosslinked and pressure-stable and therefore comparable to Sepharose and Superflow matrices (see Table 1). For high flow rates and uncompromised protein binding capacity, we recommend our novel PureCube 100 Agarose, offered for His affinity purification. GE trademark for crosslinked agarose in different concentrations and sizes. Properties of Sepharose vary depending on agarose concentration and degree of cross-linking, and not all Sepharose matrices are suitable for applications such as FPLC. Offered by several companies. 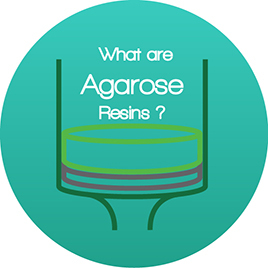 The term describes a variant of agarose that is highly cross-linked and pressure-stable, thereby suitable for FPLC experiments. This term is mostly used to distinguish pressure-stable agaroses from others that show a lower degree of cross-linking and are mostly used for batch purifications only. Table.1: Comparison of three commercially available agarose matrices. Fig.1: Chemical structure of crosslinked agarose. The higher the initial agarose concentration, the smaller the pore sizes that form after crosslinking. This is particularly important if the agarose is to be used for size exclusion chromatography. The higher the initial agarose concentration, the higher the degree of crosslinking, and the more pressure-resistant the beads become. Fig. 3: Influence of agarose concentration and degree of crosslinking on pore size and rigidity of the matrix. Ligands such as NTA, glutathione, or antibodies can be covalently attached to agarose surfaces, to enable purification of proteins via a specific interaction. Functional groups such as quarternary amines, DEAE, sulfopropyl or carboxymethyl can be coupled to the agarose, leading to strong or weak anione exchangers, or strong or weak catione exchangers, respectively. For ion exchange chromatography, proteins do not require an affinity tag, making the method suitable for the purification of proteins from natural sources. Table.2: Relationship of agarose concentration to protein exclusion limits. Fig. 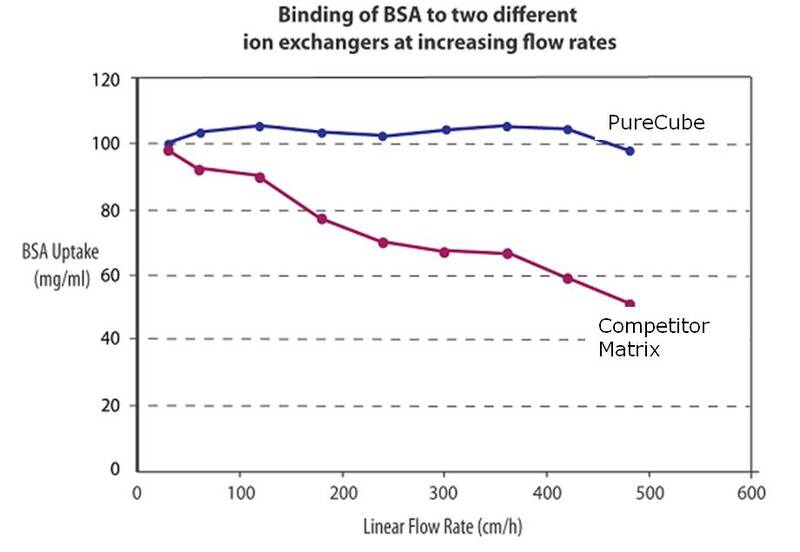 5: PureCube Agarose shows a higher dynamic binding capacity than a competitor matrix with 90 µm bead size. BSA was purified via two ion exchange matrices in a Tris buffer at pH 7.4 in a set of experiments done at flow rates from 25 to 500 cm/h, corresponding to 0.3-4.0 ml/min in a 0.8x2.5 cm column. Protein yields obtained with the competitor matrix significantly decreased when flow rates higher than 100 cm/h (0.85 ml/min) were applied, whereas PureCube Agarose matrix showed reproducibly high protein yields even at high flow rates like 500 cm/h (4 ml/min). Data kindly provided by BioWorks, Sweden. Agaroses come in different sizes, and size distributions. These have an impact on the physical properties of the purification matrix. The smaller the beads, and the more narrow the size distribution, the higher the pressure-resistance of the beads. On the other hand, the larger the beads, the faster the flow rate in batch and FPLC experiments. The smaller the beads, the higher the ratio of surface to volume, and the higher the binding capacity of the beads. However, note that the binding capacity also depends on other factors such as type and size of ligand, and density of ligand coupling. The binding capacity of an affinity chromatography material decreases when pressure builds up inside the column at higher flow rates. 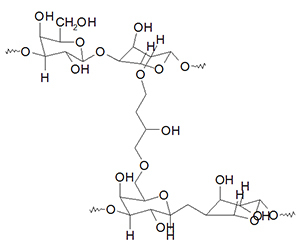 This effect depends on agarose bead size, agarose content, and degree of crosslinking. Dynamic binding capacity tells us if an agarose material can be used at higher flow rates without influencing protein yields in a purification. See Fig. 5 for a comparison of PureCube Agarose and competitor material.